Diane Gallagher, the nursing history and University archivist in the Howard Gotlieb Archival Research Center, received the 2011 Lillian Carter Award from the Peace Corps on May 19 for her commitment to public service. The award recognizes an exceptional Peace Corps volunteer who served at age 50 plus and has continued to advance Peace Corps’ third goal to promote a better understanding of people from other nations on part of Americans. 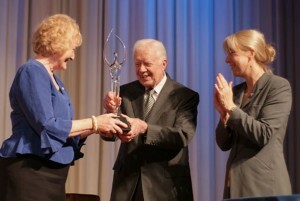 Former President Jimmy Carter and Peace Corps Deputy Director Carrie Hessler-Radelet presented Gallagher with the award at the Carter Center in Atlanta, GA. “Peace Corps service had been my dream since the day President Kennedy issued his call to service 50 years ago,” says Gallagher. After raising her family, she finally made her dream a reality by serving as a Peace Corps volunteer in Cape Verde from 1990-1992 at age 53 with her husband.